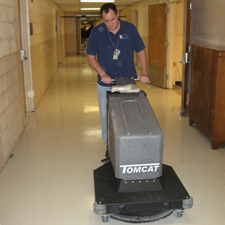 Dust control is a standard feature, which eliminates the need to dust mop the floor afer burnishing is complete. 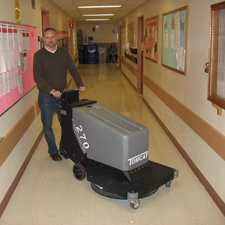 All of our battery-powered floor buffers run at a very low decibel making work easy and non-distracting during normal business hours or in places where there are constantly others walking around. 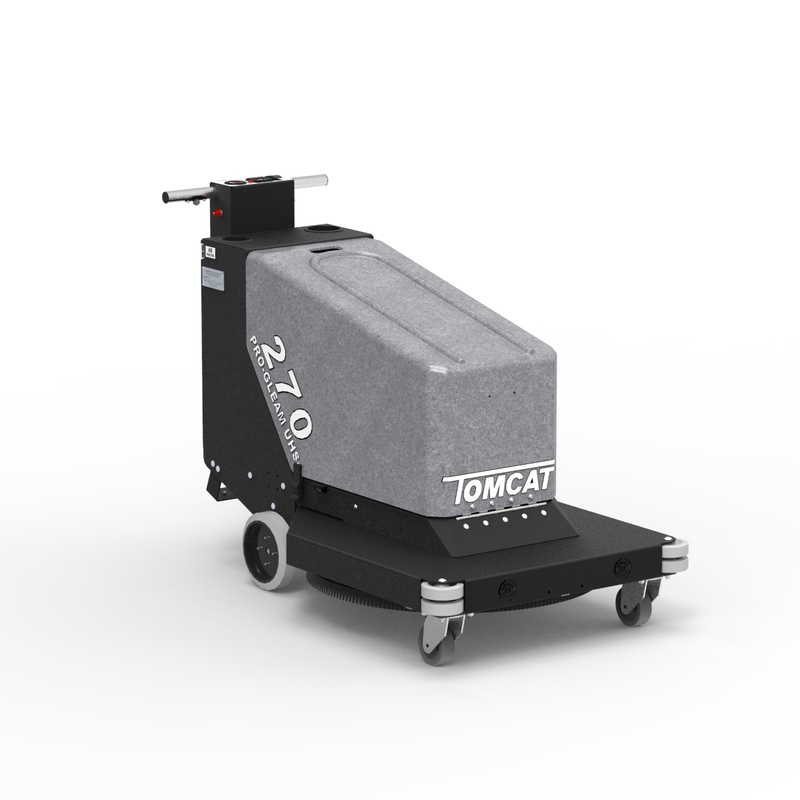 The hard, high-gloss shine developed by the Walk Behind Tomcat 270 Burnisher is due to the unique burnishing head and flexible pad design. 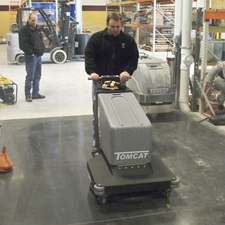 The head is ideally balanced and fully floating to provide a long lasting finish over uneven floor surfaces. 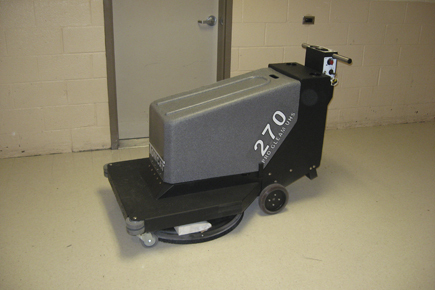 The burnishing deck is protected under the machine, and the machine tips back permitting quick pad changes. Pad pressure is variable, and a deluxe instrument cluster is standard, including an hour meter to assist with preventive maintenance scheduling. There are two different types of drive methods for the 270. One is the Pad Assist version which eliminates most need for the Operator to use any type of force to push it. The other is the Traction drive. 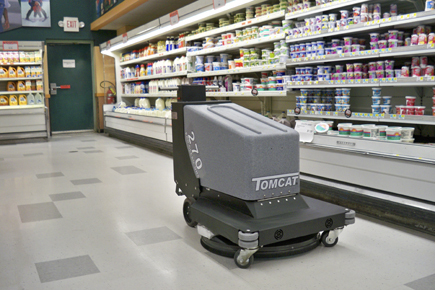 The 270-T has a powerful traction drive, which is totally sealed, all-gear and maintenance free. It makes driving the machine an enjoyable task and climbing ramps a breeze. 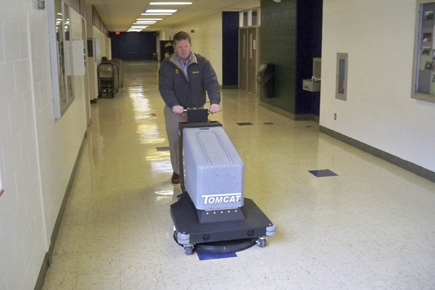 The Tomcat 270 is built to last, but maneuvers through congested areas with ease. The optional onboard charger gives operators the ability to burnish across a larger area, and the independence to recharge at any wall outlet. Dimensions (L x W x H): 52" x 24" x 40"